SYRV is a nonprofit organization committed to developing and sustaining programs that provide meaningful contribution and social responsibility supporting human rights, education and social development initiatives. SYRV is a US Registered 501(c)(3) Charitable Foundation and will supply all donors with the necessary papers to be used with their tax filings. Monique had traveled extensively around the world working in youth marketing for global brands, and not only experienced the beauty and culture of several developing countries, but also the needs of the local people that didn't appear to be receiving the financial benefits from the tourism industry. SYRV was started in an effort to give back where it seemed impossible not to while offering a trip that engages the community while fulfilling the cultural and adventure aspects of traveling. 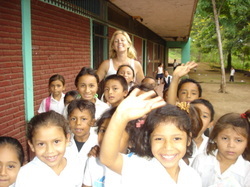 Upon moving full time to Nicaragua in 2005, Tracy Finch quickly realized the desperate needs for basic necessities. She started Proyecto Laguna, a 501c3, with the mission to improve basic education and health care through empowering the communities involved in our programs. Now living in Colorado with her husband and two boys Tracy running their organic vending company (continues to volunteer as much as possible with low income families and single mothers in her community through Kids Hope USA and the local Christian church. “It has been my pleasure to work with SYRV and am thankful for the opportunity to work with a foundation like SYRV, where I know all proceeds are making good happen! It is very fulfilling to know that we are making actual improvements in lives of our participants. I am so appreciative of the blessings my family and I have living here in the United States and hope to continue to be able to use those gifts to improve the lives of those in third world countries." Victor and his wife, Ella Carrillo, balance their lives by spending time with their family, volunteering in their local community, and working with and advising corporate companies. Born in Los Angeles to Mexican immigrants, SYRV VIII traveler, Victor Carrillo, inherited the entrepreneurial spirit from his father and has gone on to start several companies. In 2004, Victor co-founded ID marketing agency, a multi-cultural marketing agency that specializes in strategically positioning brands at the core of the Street and Hispanic market. In 2007 he went on to partner with creative agency, SA Studios Global, leading a team that immerses brands and products in the Urban and Hispanic marketplace. When Victors not working with Fortune 100 companies including Nike and Pepsi, as well as cutting edge start-ups, you'll find him film making, playing sports, restoring classic cars, and traveling to exotic locations. Lara Hoad, award winning LEED certified architect, designer, and professor has traveled and worked throughout some of the poorest and richest nations in the world. She has witnessed firsthand many of the growing issues that today’s designer’s face. With expanding roles of sustainability, environment and social change, Lara’s mission is to “Connect communities through architecture and design”. Through her involvement with SYRV and collaborating with volunteers and locals in Nicaragua she has realized this mission through the design and construction of both the water purification shelters and the community center in Jiquilillo. “The SYRV trip really gave me the opportunity to use my skills and knowledge to give back to the community. Donating just one week of my time I was able to collaborate with a great team to provide clean drinking water for hundreds of school children for many years to come. More than any other project I have completed during my career it was the water purification shelter that made the years of education at architecture school worthwhile. It is amazing to see how even the most modest project can have such a significant impact on the lives of those that are in need." 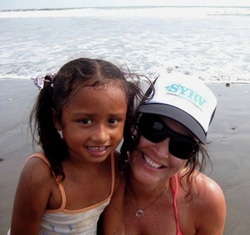 Prior to becoming a SYRV volunteer traveler, songwriter and musician Samantha Stollenwerck approached us with a big vision for herself and the people of Nicaragua. Through her music and interaction with the children she came home with a solid commitment to helping us continue the work that we do. As a recording artist she is using her name to sell merchandise that supports the woman's coop business in Jiquilillo, Nicaragua through SYRV. She also regularly volunteers with other organizations here in the states that focus on child development. Before attending law school, Melissa Raymond worked in the buffer zones of the Costa Rican rain forest on social and environmental sustainability initiatives with the Guaymi people. Since then her studies and work have taken her from Southern California to Kenya to Samoa to Utah to Canada (where she last served as in-house counsel to the Olympic committee) but she has returned to Central America as frequently as possible because of her love of the people and the diverse beauty found there. Melissa attended a SYRV trip in the spring of 2010 where she visited the recently completed community center, the local schools and several families with SYRV provided water filters. She was so appreciative of the grass roots, local act approach that Monique and her team have taken and readily agreed to serve on the board. Melissa is currently residing in a cabin in the mountains outside of Park City, Utah and spending the winter playing in the snow and developing her cliff hucking skills.